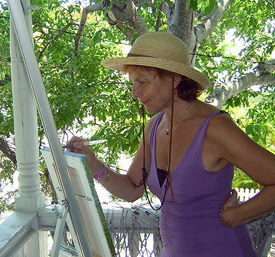 Michele Brunschvig Dariele at work – painting in Key West. I have studied painting at Marymount College in New York where I earned my B.A. and with noteworthy artists such as Melissa Harris in M.Y., Malcom Ross, Sandford Birdsey, Judi Bradford, Mike Rooney, Michele Byrne, and Roberta Marx in Key West and participated in workshops with Alex and Alyson Gray, Lian Zhen and Jeanne Carbonetti at Omega Institute, Aviva Gold in N.Y., Sue West at Naropa Institute, Boulder CO., Mitch Waite Maison des Arts, La Colle sur Loup, Fabienne Butin, Cassis, Christan Tual in Paris and others. I have also studied shamanisme in Peru and paint at times on that subject. I am also a yoga and tai-chi wellness instructor, and I enjoy singing whenever I can in various choirs and jazz bars. All that a human being has to say or do that can possibly concern mankind, is in some shape or other to tell the story of his love, to sing, and if is fortunate enough and keeps alive, he will be forever in love.